Landing your first job out of high school or college can be daunting, especially in the competitive fields of digital communication. The classic dilemma for entry-level workers with little or no experience is convincing employers that they are capable of doing the job. Now, you can validate your skills and prove your value to employers by earning certification as an Adobe Certified Associate. Employment using digital communications is rapidly expanding across all industries. At the forefront of this expansion are Adobe tools for digital communication, including Photoshop for visual communication, Dreamweaver for Web Development and Flash for Multimedia creation. Whether it’s a career in graphic Design, web marketing, video production or any field utilizing digital communications, becoming an Adobe Certified Associate can put you on the fast track to success. Demonstrate your proficiency in Adobe digital communications tools. Expand your career opportunities with industry-recognized certification. Stand apart from your peers in a competitive job market. Boost your confidence Be certain your digital media skills are up to date. The Visual Communication with Adobe®Photoshop® exam validates entry-levelskills in communication corresponding to Adobe Photoshop software. 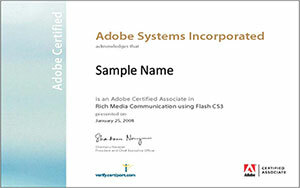 The Rich Media Communication with Adobe Flash® Professional exam validatesentry-level skills in communication corresponding to Adobe Flash Professional software.